Do you have a full license and can't use it because it has been a long time without driving and you are nervous about driving again on the road and would like to have someone to supervise you, don't worry this happens to a lot of people that for some reason or another haven't driven for a while, it is actually call "getting rusty" at driving and can be sorted. Here at Axis Driving School we can help, we have the patience to help you build that lost confidence in a gradual and smooth manner, building your confidence at your own pace making sure that it is alright for you. When starting doing lessons with us we will take very seriously your previous background and current nervousness, putting into consideration the most suitable place to choose for lessons. 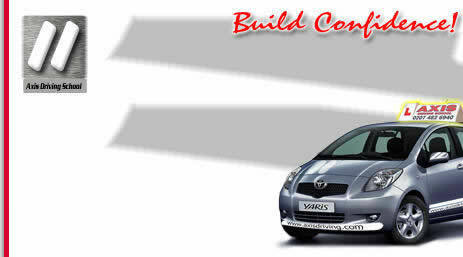 Whether it is only a matter of manoeuvres or building confidence to get into your own vehicle we can help you. Refresher lessons prices do range from area to area, if you area is not listed you may want to meet the instructor at a convenient place click here (Opens new window). Prices include a door to door collection service. Below you will have two options, one(i) is where you ask us to contact you regarding the course or two(ii) is where you check our availability to have you on board and then it will allow you to book online where you will be charged £25, this money will pay for the first hour of your first session (minimum of two hours per session) any remaining balance to be paid to the instructor directly on the day you see him/her as well as further lessons, email will be sent explaining any remaining balance.